Experience room filling music that you can feel! 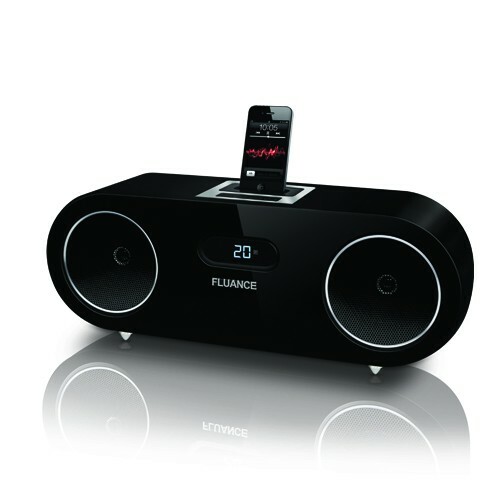 The Fluance FiSDK500 High Performance Music System for iPod/iPhone is a revolution in design and sound quality. Offering an elite, flawlessly made music system in an elegant lifestyle design, the FiSDK500 is a true sign of our devotion to exceptional audio products. By utilizing only premium components such as powerfully dimensioned, high-performance drivers and a piano black wood cabinet finish the FiSDK500 provides a pure listening experience that will harmonize perfectly with any modern living area. With superb sound radiation and rich timbre, this system is perfect for any audiophile and can handle even the highest volume levels with outstanding clarity. Enhance your listening experience with serious performance that represents a new standard in sonic accuracy and superior craftsmanship. The FiSDK500 offers high fidelity sound that you would expect from a home theater system. This music system provides unprecedented audio reproduction resulting in clean, undistorted bass, a warm midrange, and transparent natural highs at any volume level. Utilizing state-of-the-art engineering technology, the FiSDK500 brings your iPod/iPhone’s music to life with true exuberance and excellence alike. The FiSDK500 is built with premium components to ensure serious performance and natural sound. The two full-range premium 5” woven fiberglass composite drivers execute a faster response resulting in a broader dynamic range while butyl rubber surrounds provide longer excursion, better linearity and increased durability. Ultra high-end coaxial mounted silk soft dome ferrofluid cooled tweeters deliver an accurate high frequency response at any volume level. The integrated power amplifier executes extreme accuracy with minimal distortion for clean, powerful, and well-defined sound throughout the listening area. Experience the difference of serious performance; experience your music with the quality of Fluance. The perfect complement to premium components is a flawlessly constructed wooden speaker cabinet. The FiSDK500 undergoes the same caliber of cabinet manufacturing as all Fluance home theater speakers. The FiSDK500’s cabinet is manufactured with audiophile grade MDF wood construction to suppress resonance for distortion-free, accurate response and increased warmth. Two finely tuned bass ports control low frequency response and improve efficiency. The included sound isolation floor spikes eliminate vibration absorption that would otherwise distort your music. This solid wooden cabinet design provides an overall superior listening experience that represents the true meaning of high performance. Hear every detail of every instrument on every track! With the FiSDK500 it is easier than ever to listen to your favorite music. Use all of your iPod/iPhone’s media while charging at the same time. Enjoy your videos on the big screen while listening to the enhanced sound through the FiSDK500. It has an auxiliary video output to allow you to watch your iPod or iPhone’s videos on a full sized television screen. It also includes an auxiliary audio input that allows you to listen to your other audio/video devices, mobile phone or MP3 player using a standard RCA connection. The FiSDK500 contains an equalizer which allows you to adjust the bass and treble. A white illuminated display on the FiSDK500 shows the input, volume, treble and bass levels. Amplify your audio/video devices with home theater like sound that can be fine-tuned to suit your performance preferences and listening environment. The remote provides complete control of your music system. Navigate your iPod/iPhone as if it were in your hand. Find your music or control the FiSDK500’s volume, treble, bass, play, pause, and auxiliary options. Wow, I can't believe the sound from this unit. I'm an audiophile from way back in the early 80's so yes I'm a bit of a snob. I own a small brewery here in new Brunswick and wanted an Ipod dock but at the same time I want very crisp, clean sound and this unit surpassed anything I was expecting. I've been ranting to everybody about this unit. Thanks Fluance, very, very well done. Way too over priced. Nice quality, but when you can pick up Phillips DC91 with cool brushed aluminum case great styling, and also functions as a alarm clock radio and docking station with very respectable sound snd remote, it just doesn't make sense to pay over twice the price unless you're putting it in a large room. Wouldn't want the fluance on my night table! At $150.00, I'd consider the purchase; otherwise, I'll pass for now. Using in my office at work. Beautiful finish. Great sound using lossless music from iPod, even half-way through the break-in (10 hour) period. Worth the money over the $30-60 trash from retail stores. This is my second FISDK500 iPod dock that I have purchased for the incredible price of $99.00. I was so impressed with the first one, not only did I decide to buy another, but had no problem getting two of my friends from work to buy as well. It really looks impressive, but the sound is spectacular. I guess my Klipsch iPod dock is destined to be listed on Ebay !!! Very happy ! This dock is amazing I still can;t believe the sound that comes out. This is a must buy! Getting another one for my bro for Christmas! Sound is crisp. Easy to set up. Base is less than I was expecting (although I had very very high expectations based on the reviews). I also think the max volume could be higher. I bought this as a gift for someone and compared it (side-by-side) to my no longer manufactured Apple iPod Hi Fi. Grant it the Apple product had a MSRP about $100 more, it sounds better and plays louder. One major plus for this speaker dock is the component lines so you can use it as your primary TV speaker. Overall, I think it is an above average speaker for the price. OUTSTANDING product for the money! I actually got it for $99 during a promotional deal. Truly money well spent. My Bose Sound dock I had for many years broke. I was searching and researched this product. Committed to purchasing it. Got it a few days ago. LOVE IT! I loved it right out of the box, but did the break in for 10 hours. I love the full rich sound. I don't even push it past the 20 volume it turns on with. Oh, I tested it to 40 and was blown away by the volume and clarity. The sound, in my opinion, surpasses the Bose. Love it. Cool design, super well made, sounds great. Ipad and Ipad 2 can have their piece of the cake..
Ipad and Ipad 2 can have their piece of the cake.... and eat it too! IÂ´m a love fluance products, and when a fluance ipod-iphone dock was announced I quickly got excited! When I got my set of speakers, I was impressed with the quality construction and sound quality is also superb. It basically plugs to the top of the speaker and then you plug it into your ipad and voila! FULL ipad control from your fluance speaker!!!!! EVEN CHARGING IS SUPPORTED! If you look on this site, you will see this is my third review of a Fluance product. I've owned the AVHTB+, the Fluance XL7F and now I won the Fisdk500 in a design competition. I just received this in the mail. I sold my AVHTB+ to fund my purchase of the XL7F. I love this company, they got me into sound, before I started reading about and hearing good audio I thought all speakers were basically the same. You plug something in, you get sound. End of story. Well I'm a fanboy now, because everytime they've delivered something it sounds and looks well beyond what I paid. This ipod dock puts out a surprising amount of bass too. But it's designed for nearfield listening, 6 -12 feet away I'd say (though I can hear it from several rooms away), so it does go pretty loud. The bass was kind of boomy the first time I plugged it in, but when I added the metal feet (and washes to prevent scratching the boom mostly went (I think I was getting a lot of reflections and distortion from the surface it was on), I've not broken it in the 10 hours recommended yet, but with my experience of the other two systems, I know Fluance products do benefit with a good break in.. get that butyl rubber surround a little more flexible. Anyway. I'm very happy with this. It's more substantial, heavy and it sounds better than the other ipod docks I've heard, in fact it was more of these things than I thought it would be. Will it be the life and soul of the party? When you want to crank the speakers till the cops roll up? No, it won't, but it's not designed for that... If you want the cops to roll by, get the XL7Fs. The cops will roll by, but they might let you off because they like the sound. What this ipod dock delivers is really great nearfield listening with an attractive design. The sound is almost comparable to the AVHTB+.. But actually I'd say the towers in that system do sound a bit better than the dock. This is what people want though... a self powered dock for their ipod and it delivers what it promises. I would say though if you really care about great music reproduction get the XL7Fs, a good amp and you will have sound your friends really envy, the XL7Fs stand head and shoulders above the other products I've heard from them. If you want something for your bedroom or the office go ahead and get this, it won't disappoint at all. It's a really nice looking and sounding unit. Thumbs up to Fluance once again. A really great company who focus on their products rather than marketing or other BS. I gave as a Christmas gift to my son the FiSDK500 Dock Music System for his iphone. He loves it! Thank you for such an impressive product! He also loves the sleek black design of the unit.